Bombardier has sued Mitsubishi Aircraft in federal court in Seattle, alleging that employees recruited from the Montreal-based company illicitly emailed batches of Bombardier's trade secrets before they left to help the Japanese planemaker get its long-delayed Mitsubishi Regional Jet certified by U.S. regulators. Bombardier has sued Mitsubishi Aircraft in federal court in Seattle, alleging that employees recruited from the Montreal-based company illicitly emailed batches of Bombardier’s trade secrets before they left to help the Japanese plane maker get its long-delayed Mitsubishi Regional Jet certified by U.S. regulators. The 92-page lawsuit, filed late Friday, alleges that Mitsubishi Aircraft and its Seattle contractor, AeroTEC, have hired about 92 former Bombardier personnel, some after holding job fairs near its Quebec headquarters and its U.S. flight test center in Wichita, Kansas. Bombardier’s suit also names several employees that it claims misappropriated its confidential documents and data pertaining to the certification of commercial airplanes by Transport Canada and the Federal Aviation Administration. Because the process is “extremely complex and costly to achieve” for a new aircraft, “since 2000 only four companies worldwide have been able to develop a commercial clean-sheet aircraft program in compliance with the regulatory requirements” of the North American or European air-safety regulators, the suit says. 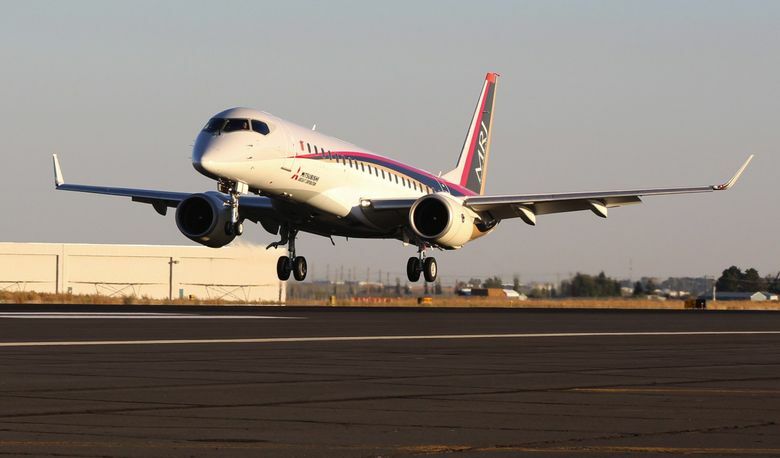 Mitsubishi, developing the MRJ as Japan’s first commercial jet in decades, had no such experience. The plane was running several years late before the company in 2014 announced its flight tests for certification would be conducted at Moses Lake, with a large complement of engineers based in Seattle to oversee the work. As of June, the program employed 600 in Washington state and was progressing methodically toward its 2020 debut, despite delays, escalating costs and barriers to U.S. sales. In addition to technical challenges, the family of 69-to-88-seat regional jets faces stiff competition from planes developed by both Bombardier and Embraer. Bombardier’s C-Series program is now under the control of Airbus, while Embraer is finalizing a joint venture with Boeing. Mitsubishi and AeroTEC sought to ease the certification process, Bombardier alleges, by hiring people ranking as high as the former director of Bombardier’s C-Series Flight Test Teams and the former C-Series Flight Test Program Manager for Bombardier. The suit names several lower-ranking Bombardier engineers it claims shipped company documents to personal email addresses in the days or weeks before they left to work for Mitsubishi. One, it claims, “sent an email from his Bombardier email account to his private ‘Yahoo’ email account (with) two proprietary PowerPoint slide decks” that contained “highly sensitive, proprietary Bombardier trade secret information” about the company’s Global 7000/8000 business jets and confidential communications with Transport Canada for certifying the planes. Another employee, says the suit, sent herself “hundreds of pages of highly sensitive, proprietary Bombardier trade secret information in the form of specific details” about the process of gathering data for certification of the C-Series regional jet. A Mitsubishi spokesman said the company has done nothing wrong and will defend itself in court. “We have been in communications with Bombardier on this matter for quite some time. We believe the allegations to be unfounded and find no merit in their assertions,” director of strategic communications Jeff Dronen said in an email. The suit says Bombardier executives and lawyers urged Mitsubishi as early as 2015 to avoid misusing the Canadian company’s trade secrets, but were largely ignored. Bombardier is seeking unspecified monetary damages as well as an injunction ordering Mitsubishi and AeroTEC not to use “any proprietary Bombardier information misappropriated by any former Bombardier personnel” and to stop recruiting its employees to obtain such information. This story has been updated to include Mitsubishi’s response.